Added on November 13, 2012 by Jourdan. For the past few weeks in my Drawing 1 class (in which I am the TA) the students have been working on these lovely perspective drawings. I was responsible for leading this segment of the class and designing a project to go along with the lessons... so I assigned an architectural perspective drawing, using ink! Here are some of my favorites - didn't they do a great job? Added on October 1, 2012 by Jourdan. My students have been hard at work on their plaster body/form projects. I'm so proud of what they've come up with! Below are some images of their finished work. Have I mentioned how much I LOVE teaching? It's been so fun to help them along with their projects, to see them discover new formal/material/conceptual possibilities. Did I mention how proud I am? Have I even mentioned on here that I'm teaching my own class this semester?! 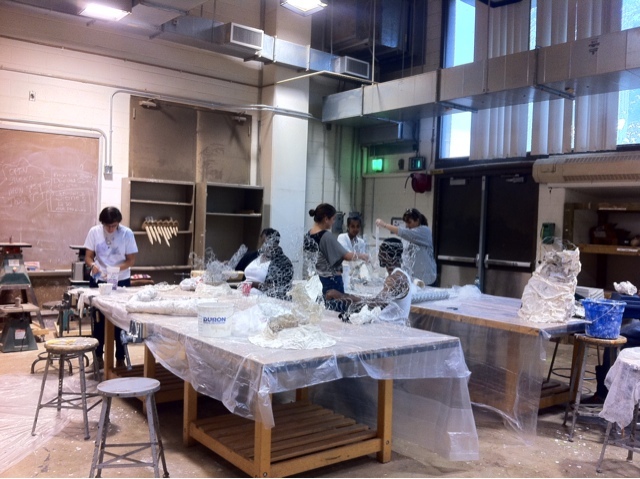 Here are my students working on their plaster projects... We've been working out in the sculpture yard when it's nice out, but yesterday was stormy so we made-do inside. I started having flashbacks to that kid's class I taught at REDUX last year. What a crazy/fun mess! We will be using the human figure as a point of departure for this project. Through the manipulation of your materials, your finished sculpture should somehow reference the human form – but that doesn’t mean it has to be strictly representational. In fact, it shouldn’t be that at all. The form you construct should fall somewhere between representation and abstraction, and should evoke/express a particular emotion (or set of emotions). Added on March 13, 2012 by Jourdan. In case you're not familiar with the artist/musician/composer John Cage, here's a video of one of his most famous musical arrangements, called 4 min 33 seconds. It consists of composed silences of various lengths. Pretty great, if I do say so myself. Added on August 22, 2011 by Jourdan. 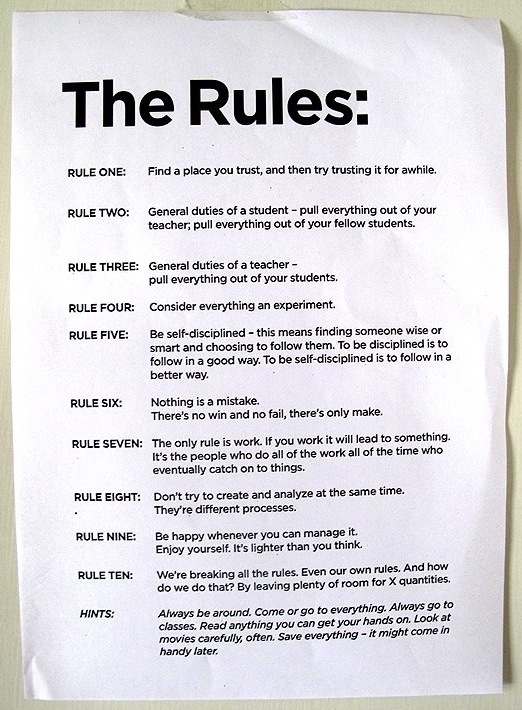 For those of us with assistantships in the department (of art, duh), our contracts began last week as well. We were each assigned duties to help prep the studios for the coming semester. Selin and Michael and I put a fresh coat of gray paint on the floors of painting studios (see below). It was a good way to break into the program and to get to know some new faces. I feel welcomed here and certainly not greeted with the anxiety of feeling like I have to prove myself or find a place to fit in. It feels natural. Perhaps that's due to the size of the program (I believe there are 14 of us total), but irregardless, it feels just right. I'm lucky enough to be starting off with a Full Graduate Assistantship, which, in exchange for 20 hrs of service to the department, pays for my tuition and provides a not-huge, but not-so-bad stipend that covers most of my living expenses. Contrary to the belief of many... grad school doesn't have to mean mounds of debt! Not all schools have the resources to fully fund their students, but there are lots of programs out there like UMD that offer generous assistantships and fellowships. Thank goodness! For my assistantship this semester, I will be a Teaching Assistant for four different sections (each with a different professor) of ART-100 - 2D Fundamentals. I'm excited about learning, in such a hands-on way, how to be a teacher (at the collegiate level). The program is structured so that, by my 2nd/3rd year, I will be teaching my own classes here at UMD, if I so wish. Let's hope my "students" aren't put off by the fact that I'm practically the same age as they are ;) Perhaps if I act really mature I'll have them fooled... that is... until they see my student ID! Added on April 22, 2011 by Jourdan. Here are some photos from my Plaster Possibilities class that just wrapped up at Redux Contemporary Art Center. The kids were great! They weren't afraid to get messy and make some really neat work. Added on January 15, 2011 by Jourdan. This Spring I'll be teaching some youth classes at Redux Contemporary Art Center. I'm very excited to work with kids in this capacity. See my class descriptions below... or CLICK HERE to see all the other classes offered up this spring! Each week students will learn about a different fundamental sculpture technique, but with a yummy twist! We’ll mold bread dough, carve melons, cast chocolate, and more! Looking at classic artists and their traditional methods, we’ll talk about the basic elements of sculpture and see how contemporary artists are pushing the envelope with nontraditional materials, like food! Bring your appetite for art! Materials included. This four-week class will be an exploration of all the sculptural possibilities of that messy white stuff known as plaster. We’ll learn to mix it, pour it, carve it, turn it colors, build with it, and more! Students will be encouraged to use their creativity to construct original 3D forms while learning all the fun things that plaster can do! Materials and snacks included. Added on January 13, 2011 by Jourdan.